Our double or twin bedroom has a double bed or two individual beds and all the services that you need for a perfect stay with us. The double room for individual use of Hotel Apartaments Jardí is perfect is you need extra space in your stay in our hotel. For a more comfortable and special stay, we offer you the superior double room, with an extra comfort to enjoy to the maximum your stay. 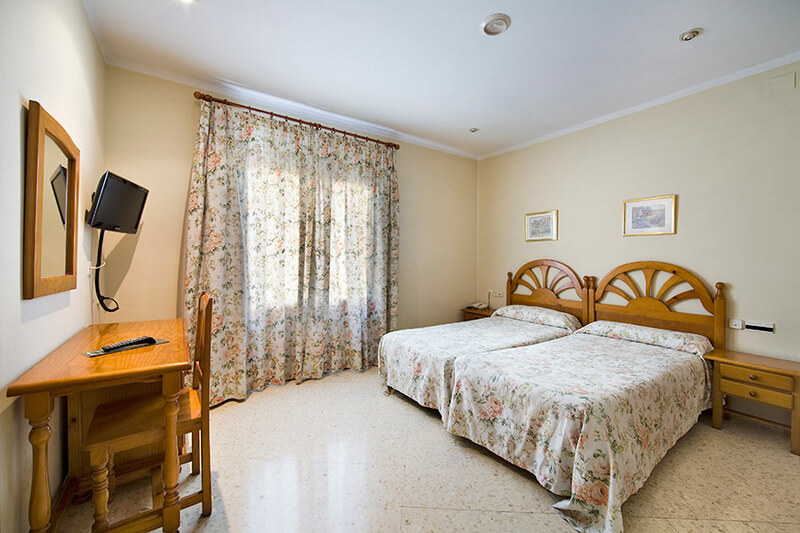 Our superior double room for individual use is perfect for you if you want to make the most of your holiday in Hotel Apartaments Jardí. Pension € 17 per day. We have available rooms and pension from € 17 per day. 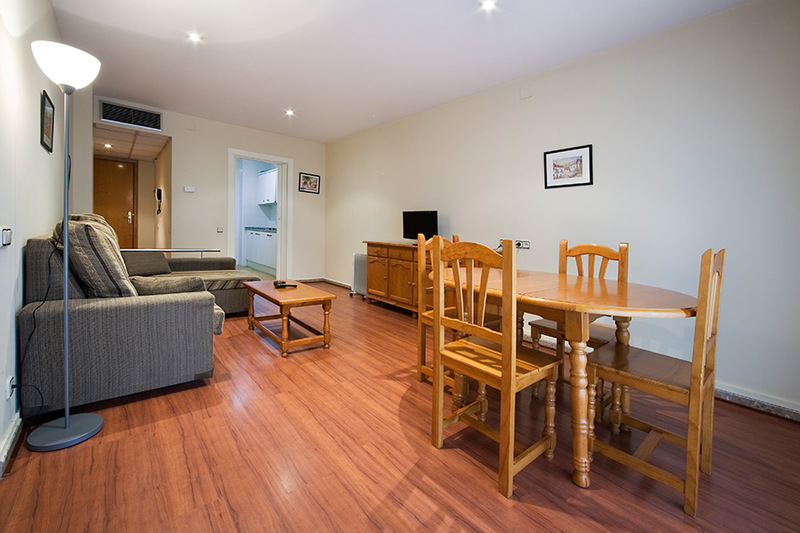 More information: info@hoteljardi.com / 973 600 191..
We have available apartments available to rent from € 335 per month. They have available all the services of the hotel. At the café bar of the Hotel, together with its select lounge, you can enjoy peace and leisure in your free time. The cafe is the perfect meeting point for you and your friends, to receive your visitors, enjoy an aperitif, a drink, or taste our menu of sandwiches, beverages and liqueurs. The lounge is exclusively reserved for the clients of the Hotel, space for reading, relaxing, playing board games, etc. In the cafeteria of the hotel you can taste a menu of dishes thought after a hard day of work. Do not forget that you can taste our dishes in your room thanks to the room service. In addition we offer restaurant service for clients and groups. In the restaurants around the Hotel you can also enjoy a variety of typical and innovative cuisines, such as Catalan, Spanish, Italian, Chinese, tapas, wines, etc. Our hotel is located in Mollerussa, the geographic and economic centre of the Pla d'Urgell region, of high heritage, artistic and cultural value. Here you can take routes on foot, by bicycle, by car or on horseback, and you will discover the history and evolution of this area visiting its monuments. In addition, the lands of this region have a great agricultural, livestock and landscape value. Come and discover the Pla d'Urgell and discover a unique land. The Lago de Ivars y Vila-sana, dried in 1951, was one of the most important moist areas of the inland area of Catalonia. At present, it is still present in the popular memory and has undergone an ecological reconditioning that has made it prosper in a considerable way. The Pilar de Almenara is located in the highest part of the mountain range of Almenara. It is a Christian tower from the 11th and 12th centuries that was used for defense and surveillance. Rounded, it has an entrance at half height so as to avoid easy access in case of attack. The farm of Castillo del Remei is an agricultural estate with cellars that is located in the municipality of Penelles. It consists of several buildings, among which stand out the castle, the Sanctuary of the Virgen del Remei, the restaurant, the oil mill or the flour mill, among others. This cathedral is one of the most emblematic buildings of the city. Its structure is Romanesque, although its vaults have clear Gothic features. It is located on the hill known as Turó de Lleida, from which you can enjoy a fantastic view of the city. The gallery of the cloister, made between the 13th and 14th Centuries, is particularly beautiful. Subsequently, in 1707 it became a military barracks and did not return to perform religious functions. A peculiar contest has being celebrated in Mollerusa for 50 years: the Paper dresses contest. This museum has the aim to show the process and tradition of creating the designs. Do you need some time of relax? Visit the Urban Spa Reneix and enjoy the treatments they offer to relax and forget all your worries. Are you a cycling lover and want an adrenaline rush? This is your opportunity! This leisure centre offers several tracks of different levels of difficulty so that all visitors can have a pleasant time and, above all, fun. An experience that you can not miss! This club develops its activity in the La Sierra aerodrome, in the city of Mollerusa. They offer courses for ultralight aircraft pilots, initiation flights, outreach flights and much more. The paradise of flight lovers, do not hesitate to visit them! This centre will delight lovers of animals, but especially horses. Here you can enjoy horseback riding, riding lessons, horse preparation for competition and much more. Come to their facilities and discover everything they offer.